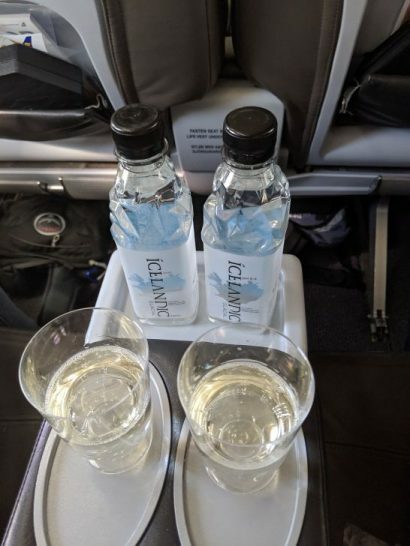 Icelandair’s Saga business class offers a premium experience across the Atlantic connecting Iceland to both North America and Europe. Icelandair’s fleet is small and consists of just Boeing 757s, a couple of 767s, and three 737 MAX aircraft which are currently grounded. 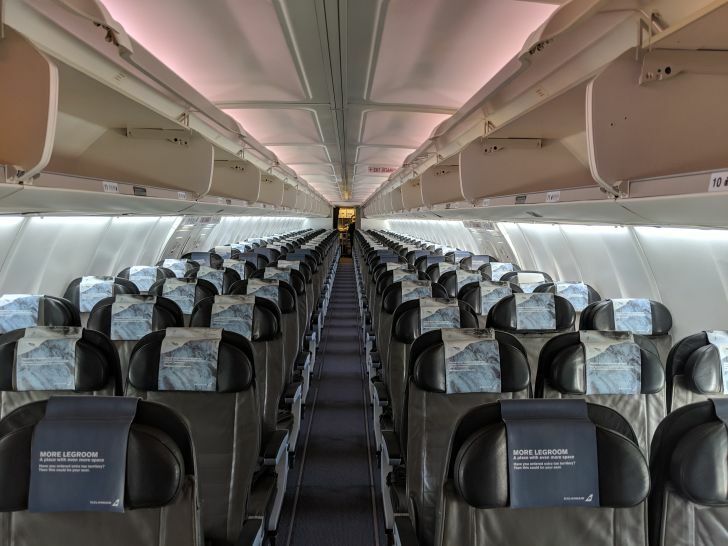 Icelandair is a hybrid carrier offering low fares to Europe without a ton of extras. 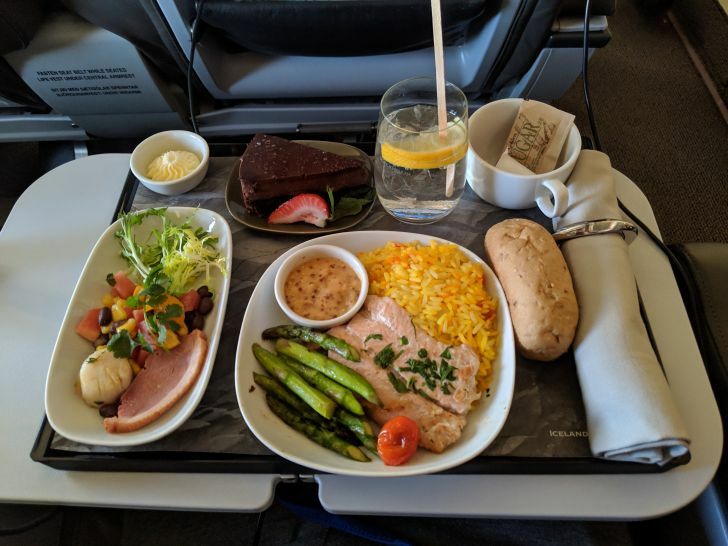 I never had flown Icelandair, so I booked a business class ticket between Vancouver, British Columbia and Amsterdam returning from Glasgow for just $2,000! This ticket was more expensive than I would like to have paid, but I also purchased the ticket just 10 days before departure. 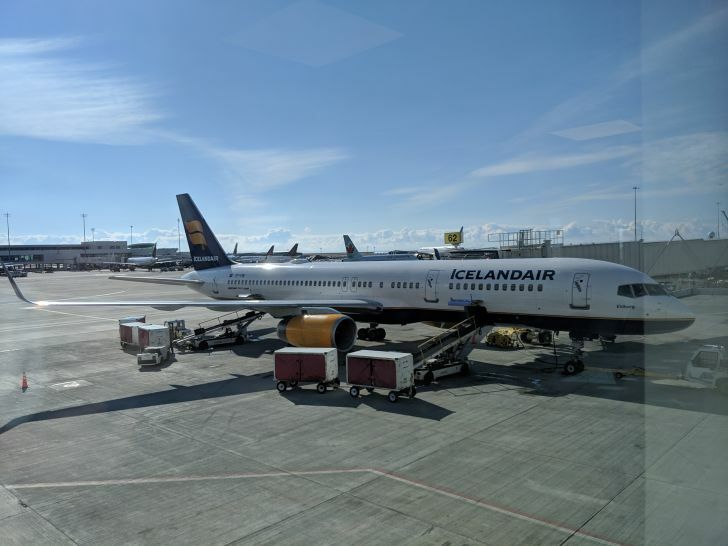 With low fares like this and from reading other reviews, I was not expecting much from IcelandAir, but I was still excited to try something new. Usually check-in is nothing exciting. I was traveling with a friend but on separate itineraries. When we checked-in in Vancouver, we noticed we were not longer sitting next to each other. The outsource Swissport agent admitted that they moved my travel companion. They then told us there was basically nothing they could do because there were no longer two seats together. 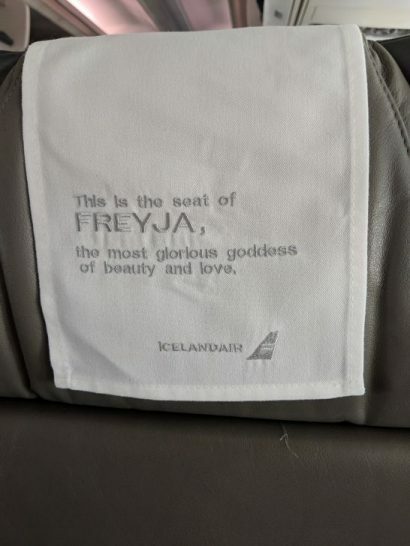 We hadn’t even left yet and IcelandAir was already disappointing me. Thankfully before boarding they fixed the issue, and he was back in the seat next to me and whoever was in that seat was moved. 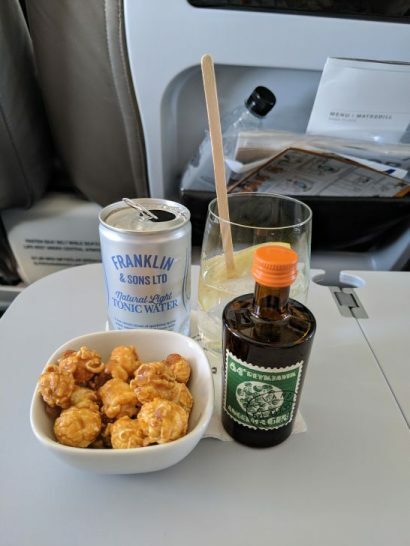 When it was boarding time, we headed toward the gate and settled into our seats, enjoyed a pre-flight drink and explored my seat and cabin. 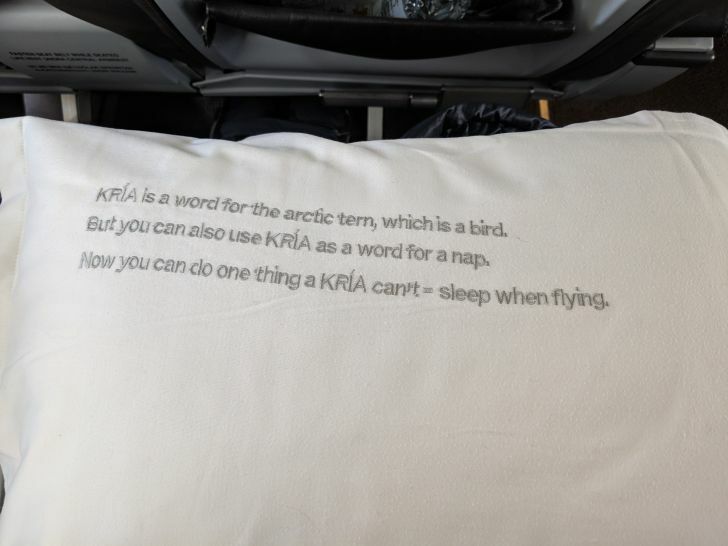 Icelandair has tons of information about Iceland and their language all over the cabin. The fun information makes every ride slightly more enjoyable You can find quotes on the head rests, pillows, blankets and more. Business Class Cabin & Amenities. The Saga Class cabin on the Boeing 757 consists of five or six rows of 2×2 recliner seats. These seats are very similar to what one finds on domestic airlines in the United States or Canada. Each seat is 20.5 inches wide and offers 40 inches of pitch with a foot rest. 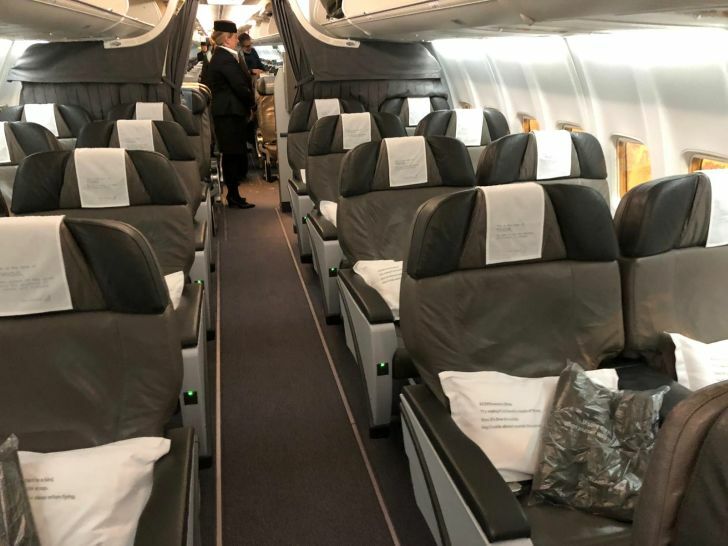 These is more legroom and recline than domestic airlines, but regardless for a transatlantic flight is more similar to premium economy than business. Each seat also has a universal power port and a USB charger in the IFE. Each seat in business class also has a tablet style seat back entertainment device. The IFE includes free movies, TVs, games, and music. Movie selection is very limited with only about 30 options. Saga class passengers also get noise canceling headphones. 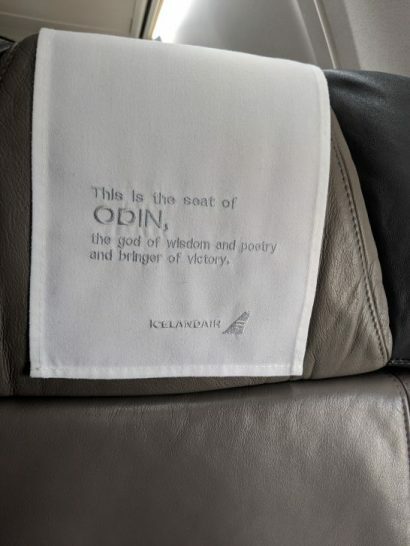 Each of Icelandair’s planes is also equipped with wifi. However it is painfully slow and does not work most of the time. Regardless, it’s another way to stay busy during the flight. WiFi is free for business class passengers. 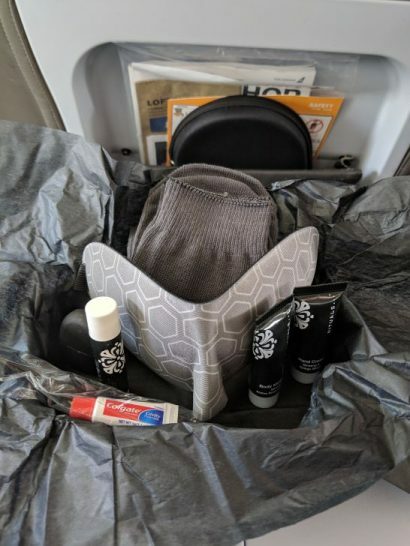 During flights to and from North America amenity kits are available to business class passengers. The kits are styled after the basalt columns found on the southern coast near Vic and are among the bulkiest amenities kits I’ve ever seen. A huge waste of space and plastic. Inside each amenity kit are all the basics. These include an eye mask, Ritual-branded chapstick and lotions, a dental kit, socks, and earplugs. Although I was not a find of the kit design, I must say the contour eye mask is among the most comfortable eye mask I’ve ever used. I plan to carry this with me and use it as much as possible. When boarding the aircraft each passenger is offered a bottle of water regardless of class. The flight attendant working the door hands it to everyone when the board the aircraft. 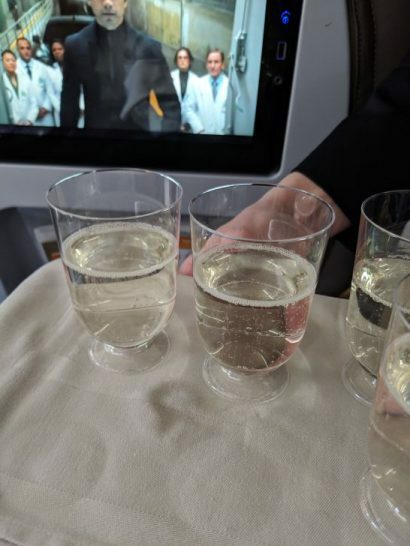 Then in business class a preflight glass of champagne is available. Once we were in the air, flight attendants took drink and dinner orders. 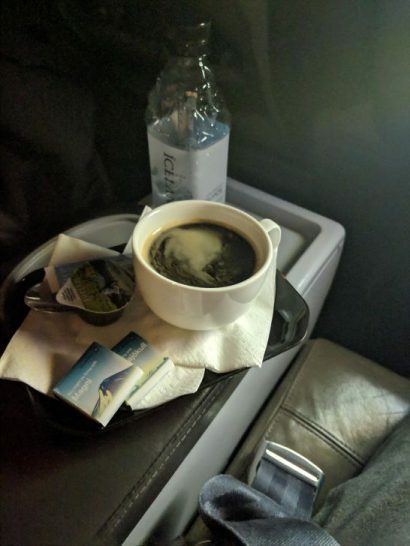 First there is a round of drinks and sweet popcorn and then about 30 minutes into flight a hot meal is served express style. Everything is served on one tray. 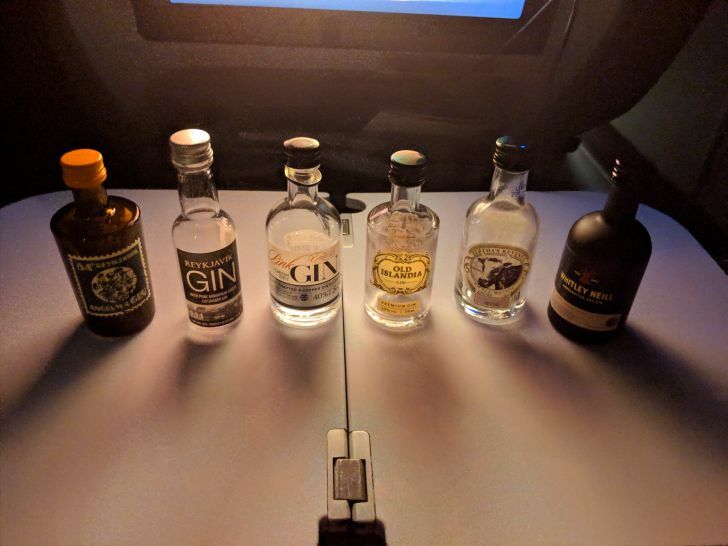 Icelandair offers a Gin Library, so my travel companion and I decided we would try them all! Slowly over the next 7 hours we taste tested each one, sharing them as we went to do side by side comparisons. Of course there are other drinks such as instant coffee, tea, soda, Icelandic beer, and other spirits. However, I stuck to gin and water. Every type of Icelandair gin! Before arrival in Reykjavik there is no pre-arrival meal. Instead after cleaning up the cabin, flight attendants pass out a snack menu. 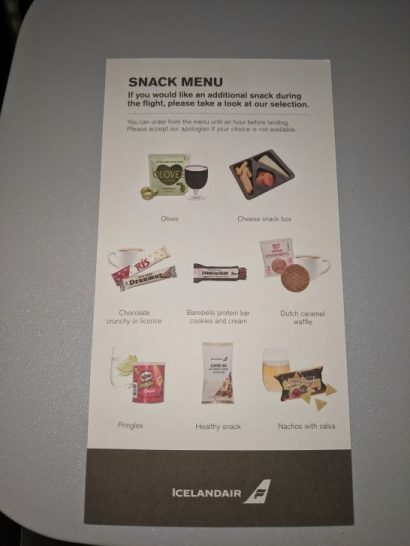 Snacks can be ordered at any time up to one out before arrival. 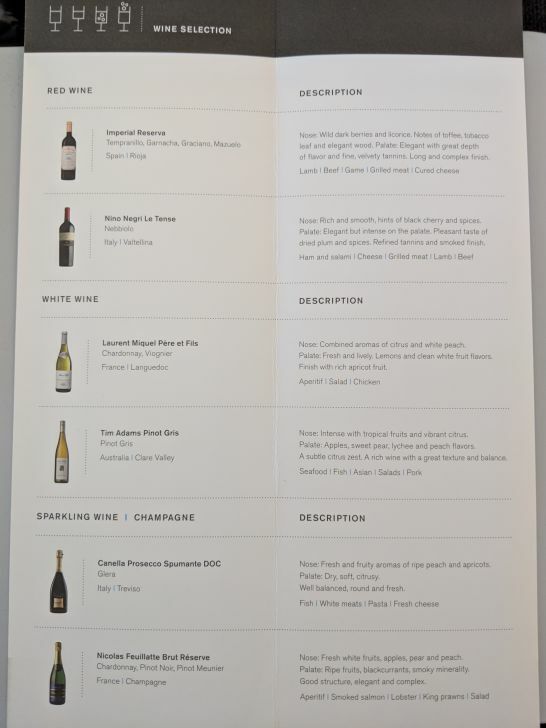 Nothing on the menu is of real substance, but then again Icelandair’s longest flights are only 7-8 hours. 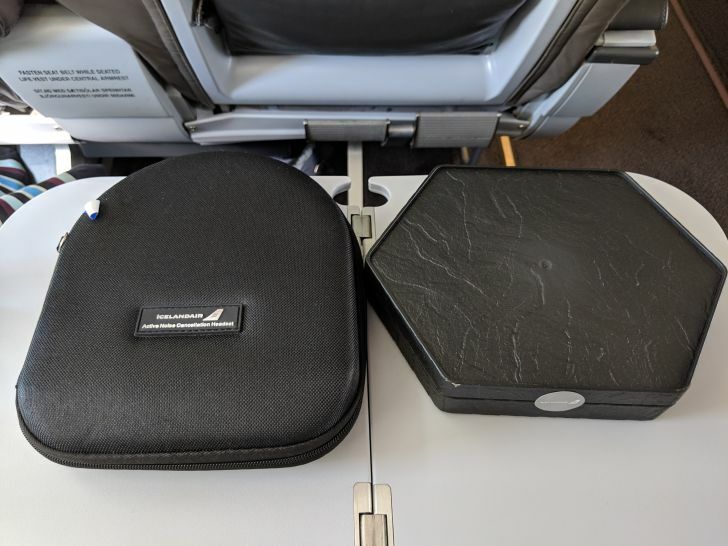 IcelandAir offers a solid Premium economy product marketed as business class. The fares are low and the crews are nice enough. On my four flights with Icelandair, not a single crew member was overly friendly or proactive. Despite this, whenever they were asked for something they provided it with a smile. The true highlight of Icelandair’s business class is the Saga Lounge at KEF. If you’re looking to sleep on your way to Europe and want a bed, I cannot recommend Icelandair. However, if you’re looking for a cheaper option that is better than economy but cheaper than business class, consider Icelandair. The food is decent and the gin is plentiful!